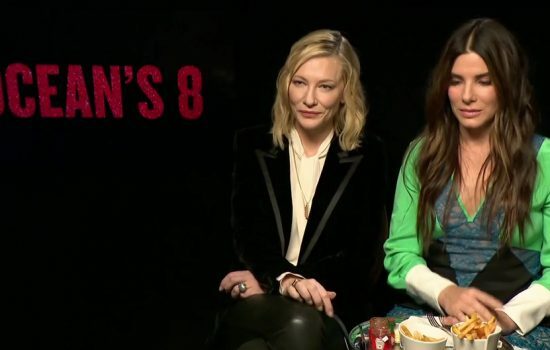 The Ocean’s 8 press tour hasn’t stopped yet so we bring you MORE interviews and a new poster. Enjoy! ‘Ocean’s 8’ kan rekenen op een indrukwekkende sterrencast. Beleefden jullie naast de set evenveel plezier met elkaar als in de film? Met meer dan 95 acteerprijzen op je palmares lijkt jouw indrukwekkende carrière één groot hoogtepunt. Heb je soms het gevoel dat je de loterij hebt gewonnen? Drie jaar geleden besloot je om na drie flinke zonen nog een dochtertje te adopteren. Hoe is de dynamiek sindsdien in jullie huishouden? Nog even terug naar je rol in ‘Ocean’s 8’. Zit er in jou een sluwe dief verscholen? 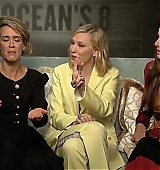 Ocean’s 8 has more A-list actresses than virtually any film in Hollywood history, but its stars say it’s time they demanded more equality behind the scenes. With countless box office smashes to their names and a best actress Oscar in each of their trophy cabinets, Sandra Bullock and Cate Blanchett are Hollywood veterans. 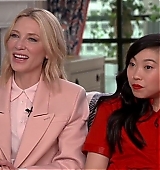 It’s one of many answers Blanchett delivers with a glint in her eye while speaking to BBC News, seated next to her co-star. But, she adds, the pair’s latest movie is unlike any other she’s starred in recently. Ocean’s 8 topped the US box office last weekend and has had mostly positive reviews – but one criticism it received is that it’s simply jumping on the back of a male franchise. 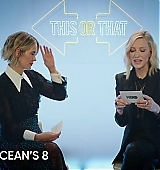 Speaking to the BBC last year, film critic Rhianna Dillon pointed out: “They could’ve just done a fantastic heist movie with women, and not have anything to do with Ocean’s anything. 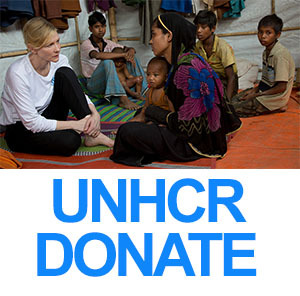 I suggest to Blanchett maybe an original film could’ve been made instead. “Absolutely! Bring it on,” she replies. But, she goes on to defend the thinking behind Ocean’s 8. “When someone has an idea they’re really passionate about, as [director] Gary Ross did, he saw Sandy [Bullock] at the centre of this story, and I thought, ‘Wow, can that work? That’s got a lot of chutzpah that idea’. “And when he listed the women he wanted to put together, he was so passionate about it, you think, ‘Great, go and make that’. “[The film] doesn’t say, ‘Only make extensions of franchises men have been in’. This film cannot stand for every single film. So, given the main cast is female, what was the gender split like in the crew? 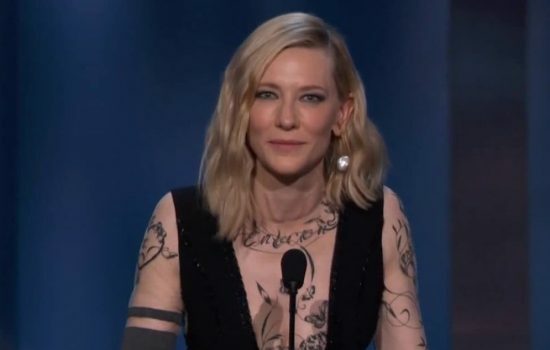 “Very male,” replies Blanchett instantly. “Costume designer was female,” Bullock adds. 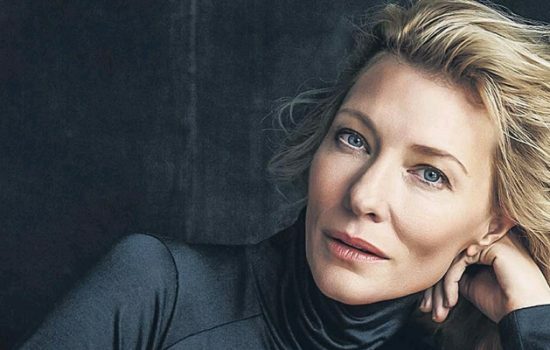 Representation behind the camera is an issue Blanchett has been personally monitoring for some time. “I’ve been doing this thing on every film set I’ve been on in the last few years, and having stepped away to run a theatre company for 10 years, I’ve come back, and all those clapper loaders who were women, they’re not [camera] operating. They’re not lighting,” she says. McDormand called for inclusion riders – clauses in film contracts which stipulate there must be equality among cast and crew – when she accepted this year’s best actress Oscar. 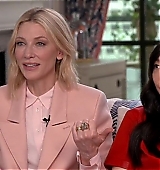 Blanchett and Bullock begin riffing off each other as they make clear how strongly they feel about this issue. Paulson is no stranger to films but arguably made her name on TV, and last year won a Golden Globe and an Emmy for her role in The People vs OJ Simpson. “There was a time where nobody wanted to do television, it was just a bunch of dodos, and it was like, ‘You can’t get any film work huh? Going over to TV? Aww, I’m sorry’,” she remembers. Nicole Kidman and Reese Witherspoon are among the stars of the big screen to have recently made the leap to TV, as the leads in HBO’s Big Little Lies. Meryl Streep is joining the show for the second season. Bullock agrees: “I honestly feel the Netflix world, the streaming world, is influencing the quality of films.